Free Shipping Included! Granvela Car Charger Bluetooth Headphone 2in1, Wireless Bluetooth Stereo Earphone and Fast Car Charger for iPhone Android Smartphones, Tablets, Music Players, R6000, Black by Granvela at DJ Luu. MPN: r6000-black. Hurry! Limited time offer. Offer valid only while supplies last. The Granvela R6000 integrates Bluetooth earphones and car charger into one device, providing great convenience for you to use. 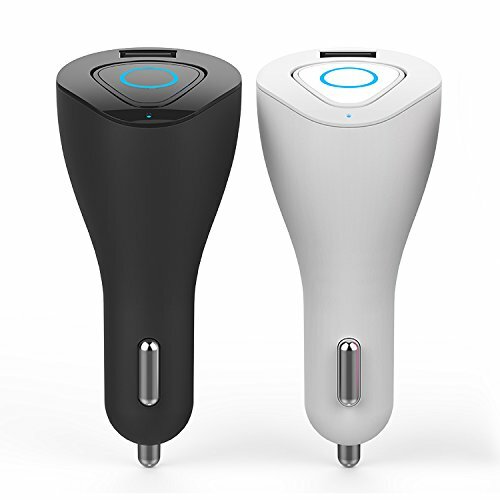 While used as bluetooth earphones, it ensures you stable signal connection and high-quality sound for music and calls; while used as car charger, it can charge your devices, like smartphones, tablets and music players. It can be your perfect partner in life. The professional Bluetooth chip and SBS high-performance transcoder are adopted to achieve low-delay and loss-free audio transmission. The R6000 uses Bluetooth 4.0 version, and support smart terminals equipped with Bluetooth function, such as tablets, cell phones, smart watches. The innovative ring-shape LED indicator is elegant and fashionable, designed to inform users of incoming calls. The R6000 headphone can be charged as soon as the vehicle is started, or be charged in standby mode when mounted on the base. Therefore, the power supply of the R6000 can always remain uninterrupted. Advanced Technology: Bluetooth 4.0 ensures stable signal connection for unparalleled HD HIFI stereo music and excellent sound quality within 10 meters. Easy to Access: The interface on one side of the earphones allows you to adjust the volume, play / pause, select songs and answer / hang up calls completely effortlessly. Universal Compatibility: The headphones are compatiable with iPad, iPhone, iPod Touch, Android Smartphones, tablets, Bluetooth-enabled music players and any device with bluetooth connection. Ingenious Design: The Granvela finely integrates Intelligent headphone and vehicle-mounted charger one, inspired by "The Heart of The Ocean" in the movie "Titanic". Characteristic: It can connect 2 phones at the same time, also specially designed for easily dock mounting. Remaining battery will be shown while connecting iPhone devices. If you have any questions about this product by Granvela, contact us by completing and submitting the form below. If you are looking for a specif part number, please include it with your message.